Bright Agrotech, a company developed by a University of Wyoming graduate using UW-licensed technology in UW’s business incubator, has been acquired by a Silicon Valley company that plans to maintain and enhance the Wyoming operation. Plenty, a field-scale vertical farming company that aims to reshape agriculture to bring fresh and locally grown produce to people everywhere, announced the acquisition earlier this month. Bright Agrotech, with 43 employees in Laramie, has developed several products to encourage people to farm. The company’s products include the ZipGrow Tower and ZipGrow Matrix Media. The company’s technology combines the principles of hydroponic systems -- in which crops are grown without the use of soil -- and vertical crop growing to maximize space use efficiency. 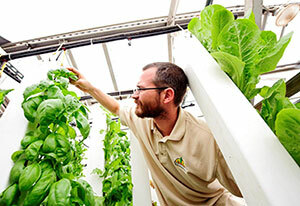 These hydroponic towers are highly productive, modular and are functional in a variety of plant production settings. Storey received his doctoral degree in agronomy from UW in 2012. After winning the 2011 UW College of Business $10K Entrepreneurship Competition with business partner Paul Bennick, of Gillette, Storey spent a few more years developing his business with the assistance of UW’s Wyoming Technology Business Center (WTBC). In 2015, the Cheyenne native “graduated” from the WTBC and moved his business operations to the Allsop Inc. warehouse facilities on Commercial Drive in Laramie. And construction is underway on a new, 12,150-square-foot building in the Laramie River Business Park to house the growing company. “This is another home run for technology-related business development stemming from bright minds associated with the University of Wyoming,” says Bill Gern, UW’s vice president for research and economic development. He notes that this is the second UW spinout company acquired by a Silicon Valley firm: Firehole Composites, whose origins sprung from UW’s Department of Mechanical Engineering, was acquired in 2013 by Autodesk Inc., which focuses on 3-D design, engineering and entertainment software. “The university has been instrumental in changing the business landscape in southeastern Wyoming, and Laramie is now truly a tech hub,” Gern says. Bright Agrotech’s technology and industry leadership, combined with Plenty’s own technology, will help Plenty realize its plans to build field-scale indoor farms around the world, bringing the highest quality produce and healthy diets to everyone’s budget, the company’s media release says. Bright Agrotech has partnered with local farmers for over seven years to start and grow indoor farms, providing high-tech growing systems and controls, workflow design and grower education through Upstart University. Storey plans to stay in Laramie and will travel often to California. All 43 local employees will be retained, says Chris Michael, Bright Agrotech’s CEO.